On 5th day, I think I spent most of day on beach near Trogir, but don't remember well. Most of beaches in Croatia are rocky compare to Japan or Australia which have sandy beaches. Advantages of rocky beach is that waves won't kick up sand on the bottom of the sea, so that sea water is always clean and transparent. Still, it's a bit painful to walk on such rocky beach barefoot. Inside the sea water is also rocky, so if possible, prepare a pair of beach sandals (a pair of thongs) with a strap such as an ankle strap. That would be very handy. In the evening of the 5th day and 6th day, I walked around Split. 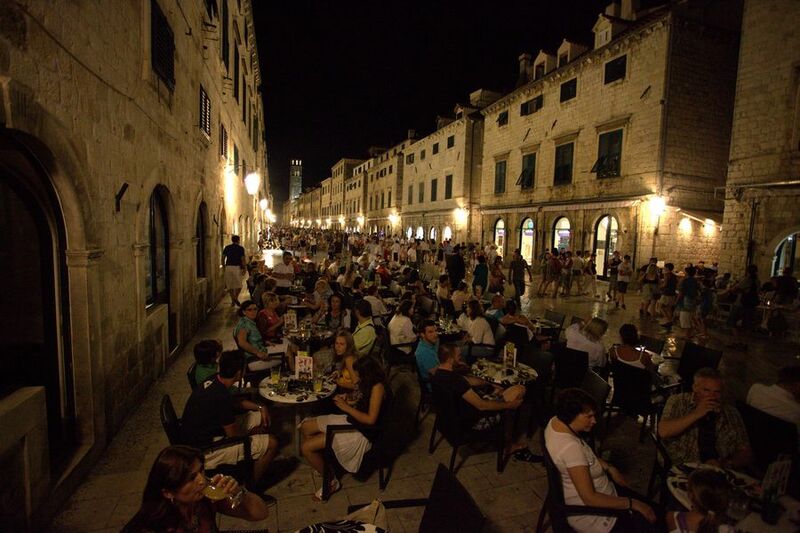 The main attraction of Split is the Diocletian's Palace, which is a great heritage of the Roman Empire. 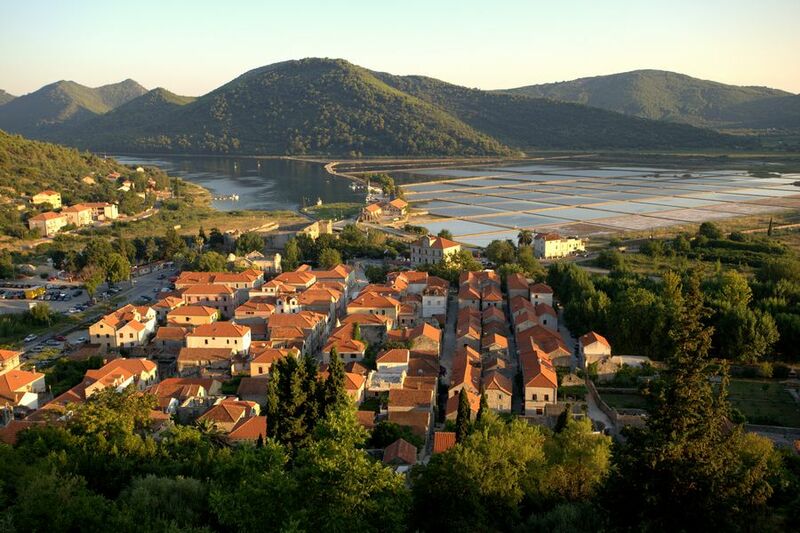 Actually, when you travel along the coast line of Croatia, you will notice that these areas are heavily influenced by Romans and Italy, comparing to Zagreb, which is influenced by Austria. I didn't have a chance to go, but it seems like you can climb up the tower. Also, females who wants to entre the Cathedral must cover their shoulders (e.g. if you wear a sun dress or sleeveless shirt). If you don't have a shawl or something to cover your shoulders, don't worry. You can actually borrow a shawl in front of the Cathedral. If you get tired from walking under the strong sun and heat, try The Basement Halls of the Palace. 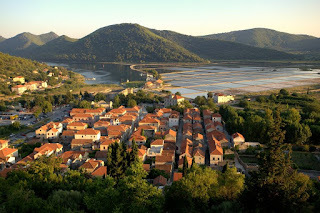 Croatia is famous for Truffles along with lavender, salts, vine and olives. If you try to find a truffle pasta in Japan, that would cost you a lot. But here in Split, I found truffle pasta in reasonable price, about 17 euros. When I walked in Split, I found that roads are so flat and slippery. Maybe because surfaces of the roads have been worn by people walking on them over long years. So, I had to be very careful while walking so as not to slip, but it is very romantic to think about a lot of people waking on the same path over the past in the long history. In the morning of the 7th day, I left Split to Dubrovnik. A trip from Split to Dubrovnik by car takes about 4 hours. It's relatively long, but it's very enjoyable drive. When you travel down to Dubrovnik along the coast line, the beautiful view of the Adriatic Sea spreads in front of you. On the way to Dubrovnik, I stopped at a small town called Ston, which is according to my guidebook famous for natural salt and the second longest wall after the Hadrian's Wall in England. There are a few tourist there, so I could have this small but hidden gem village all to myself. When you walked up to the top of the wall, you have a clear view of all the town and salterns. On the 8th day, I finally reached Dubrovnik! Dubrovnik is, as is described as "Pearl of the Adriatic", very very beautiful and charming city that retains atmosphere and remnant of the Middle Age. When you walk around the city, you will notice that there are scars of the war remain. It's amazing that the city has restored its beauty from the war that destroyed the city. Dubrovnik has lots of small and narrow passages, so it would be very fun to explore the city and find your own favorite spot. Also, don't forget to take time to walk on the wall, which surrounds the city. From the top of the wall, you will find and see a bit of local people's life and secret cafes that stand on edge of the cliff looking down the Adriatic Sea. Here too, surface of the passage is very slippery, so be careful. I walked the wall barefoot there, too. If you have time, take a cable car up to the top of Srđ Mountain. The cable car was completely destroyed during the war, but was restored and started operating from 2010. The return ticket of the cable car was 73 kuna for adult. A bit expensive considering prices in Croatia, though. But it's worth visiting the top of the mountain. You have panorama of Dubrovnik and islands nearby. When I visited there, there are a few people, so I enjoyed the breathtaking view in a quiet atmosphere. Another thing I would recommend is, if you are interested in natural cosmetics, the 3rd oldest pharmacy in Europe, Ljekarna Mala Braca, which is located inside of the Franciscan Monastery. The pharmacy sells various facial cream, toners, eye cream, hand cream and so on. I especially liked rose-scented toner and facial cream. They have not too strong but subtle and firm elegant scent. Dubrovnik has its unique charm and elegance, that attract many tourists. I would definitely love to visit there again and spend more time to explore this lovely city.